When you link to a website, you can send it a Webmention to notify it. 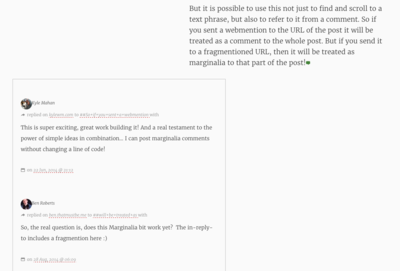 If it supports Webmentions, then that website may display your post as a comment, like, or other response, and presto, you’re having a conversation from one site to another! 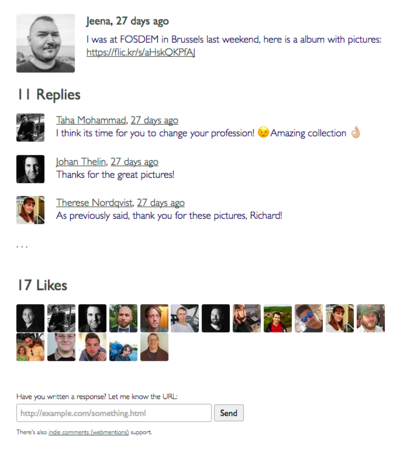 Indie Web sites that have implemented webmentions and display them nicely! See and add to Webmention developer: IndieWeb Examples for a more thorough time ordered list of sites supporting Webmentions with development details. Barnaby using Taproot on waterpigs.co.uk as of 2013-06-11. 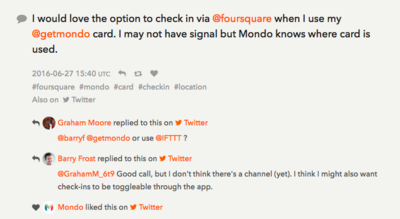 Posts had a hyperlink in footer "How to comment on this post" to instructions detailing posting an h-entry with h-card and how to send a webmention. Kartik Prabhu on kartikprabhu.com as of 2013-12-03. 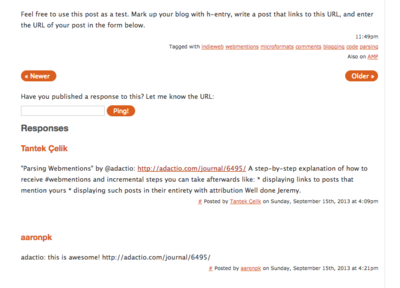 Articles have an input form for sending a manual webmention inspired by adactio.com. The form prompt links to the webmention endpoint. 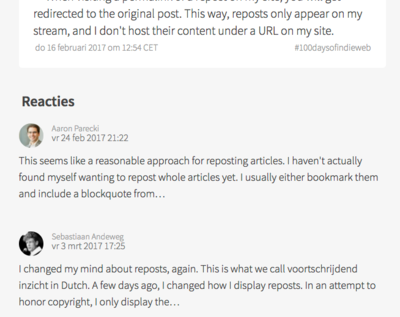 Webmentions are saved as responses and appear below the article classified according to response type. Has a manual form for inputting webmentions for those without outgoing webmentions enabled on their own site yet. As of 2017-10-06 using facepiles for likes, mentions, reposts, bookmarks, etc. courtesy of Semantic Linkbacks plugin. These are displayed at the bottom of the comment section below native comments and webmention replies. Stuart Langridge sending and receiving webmentions on kryogenix.org as of 2014-11-29. 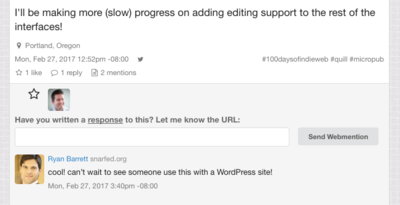 WordPress has a plugin to enable webmention functionality. b2evolution began supporting Webmention with the release of version 6.11.0-beta. Services that automatically send and/or receive webmentions for the content post there. Lobsters (lobste.rs) sends webmentions for any links aggregated there. Bridgy Publish also supports webmention as a mechanism to trigger POSSEing to Facebook, Twitter, and Instagram. Jekmentions was a service that receives webmentions and stores them in a git repository. Lazymention is an open source service you can run on a Node.js server to send Webmentions from static sites. Its general purpose is to add dynamic building-block features to otherwise static websites. stapibas is a self-hosted service to send and receive webmentions for websites and blogs. It can be used to send out webmentions and pingbacks for new posts on static sites. Telegraph is an open source project and hosted service for sending webmentions and pingbacks. You can use it to send mentions to all links on a page, or send a webmention with specific source and target. Firefox add-on to send webmentions though context menu (source on Github); The original functioning addon has been removed from the Firefox site. 2016-03-18 James Richman on WPTavern: Is W3C Replicating the WordPress Pingback System? Lurking behind that unassuming name lies something that might eventually offer users a way of ditching not just Facebook and Twitter but also those other massive corporations straddling the web. 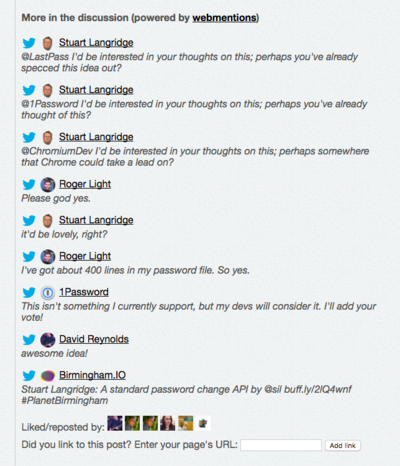 2014-11-29 Stuart Langridge Enabling Webmentions - inventor of Pingback enables webmentions on his blog! This page was last edited on 23 March 2019, at 09:18.